A formal complaint has been lodged to the European Commission by four animal welfare organisations over what they claim are systematic failures by Ireland regarding compliance with EU legislation on the protection of animals during transport. The commission has been urged by the animal welfare organisations to institute infringement proceedings against Ireland because of the recurrent nature of breaches in animal transport regulations dating back to 1999. Eyes on Animals, a Dutch NGO and animal welfare charity, claims the latest alleged breach came to light after it followed two- to four-week-old calves transported from Ireland by sea to Cherbourg in northern France and then on elsewhere in Europe. The group says serious animal welfare concerns arose out of breaches of EU Council Regulation 1/2005 which sets out mandatory rest times and periods where these very young animals must be given access to liquids/food/water during transit. The regulation makes clear that after 18 hours of travel by sea, unweaned calves must be unloaded from the truck, rested and fed. If the 18-hour limit is exceeded while the calves are at sea, they must be unloaded for at least 12 hours on arrival at the port of destination or in its immediate vicinity. Eyes on Animals contends that this did not happen in the case of a number of Irish calf trucks. On arrival in Cherbourg, a ferry journey of some 19 hours, they claim some trucks were observed continuing their journey by road, driving a further five hours before unloading their calves for rest and sustenance. 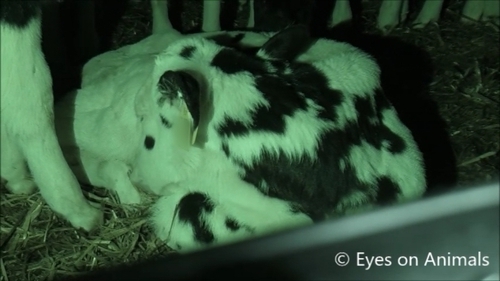 According to Eyes on Animals, the driver of one truck confirmed the calves in his care had been confined to his truck for over 32 hours - more than 13 hours above the maximum time allowed by EU transport legislation. This, they say, would have seriously compromised the calves' welfare as they would have been extremely hungry and thirsty. The letter to the commission also highlights alleged breaches regarding access to water and the number of attendants on the ferry; just three drivers remained on board to care for between 4,000-5,000 animals says NGO and charity Compassion in World Farming. In the letter CIWF expresses particular concern that the Irish Department of Agriculture appears to have approved the journey logs in advance knowing that they were in breach of EU transport regulations. The Department of Agriculture, in response, points to extreme weather conditions earlier this spring - this placed pressure on transport arrangements to the continent. It acknowledges in circumstances where resting and feeding stations were full they did issue permission to transporters to drive on. In the cases documented by Eyes on Animals, however, there was capacity for the Irish calves at the nearer Cherbourg station but trucks chose to drive on. The department has confirmed that those transporters have been penalised following a full investigation. They say from 2019 they will be insisting that all calf exporters use the rest and feeding stations nearest the port of Cherbourg, adding it will no longer be acceptable to avail of the rest and feeding station used in this investigation situated some five hours' drive away. They say these new instructions are currently being communicated to all livestock exporters.